Kalymnos should be the top destination for each diver, for the sea offers a particularly rich undersea ecosystem. Its unique characteristics and advantages are: The big traditional and educational experience regarding the professional scuba diving. The diving environment, the experience and the mentality. The first Scuba Diving Park in Greece. It offers 12 km of clear coastline just for scuba dives, being the biggest in Greece. Kalymnos has been consecrated as one of the more important climbing destinations in the world. This honor is due to the excellent quality of its rocks, its easy and quick climbing as well as due to the mild climate of the island during all over the year. The variety of the 550 routes of climbing offers infinite possibilities of working your body while climbing, as the degrees of difficulty start with the learning routes of the 4c level for the beginners and reach until the 9c level for the advanced ones. The small Dodecanese island of Kalymnos in the Aegean Sea is renowned as the center of the Greek sponge diving industry, which has flourished on the island since the ancient times. 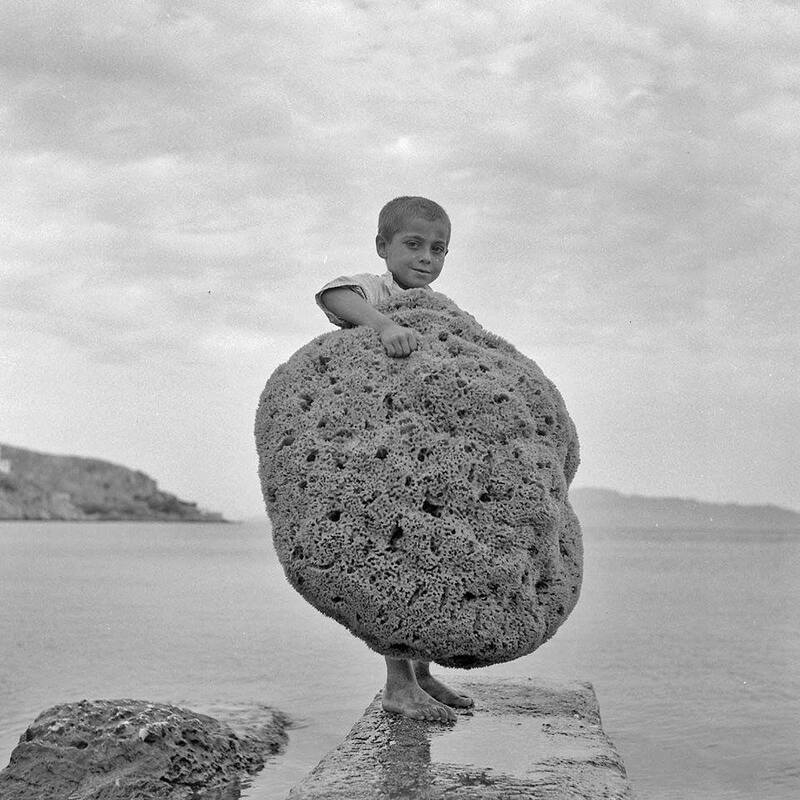 The history of sponge diving in Greece dates back to antiquity. The sponge and its usage is mentioned in the Homeric epics of Iliad and Odyssey, as well as in the writings of the philosopher Aristotle. The philosopher Plato also refers to sponge as an article that was commonly used in bathing, mostly by the rich people. Sponge diving has been called "the oldest profession" on the island of Kalymnos. 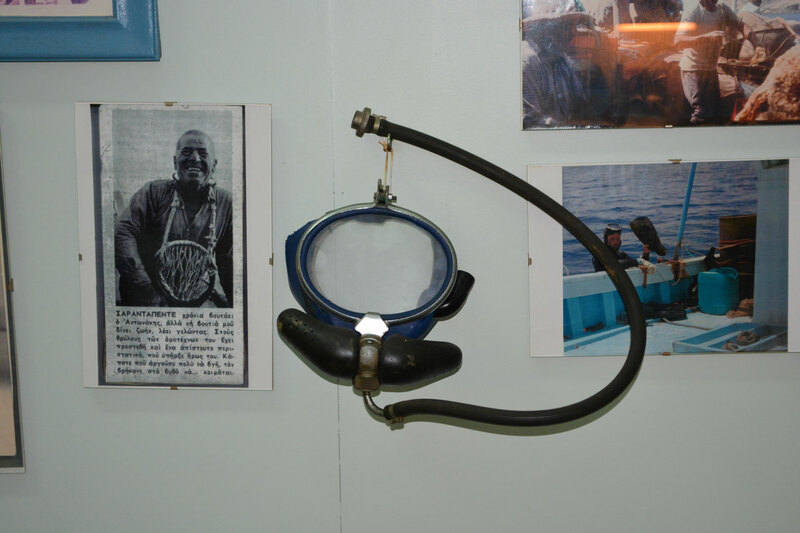 The sponge diving industry contributed immensely to the economic and social development of the island a few decades ago. 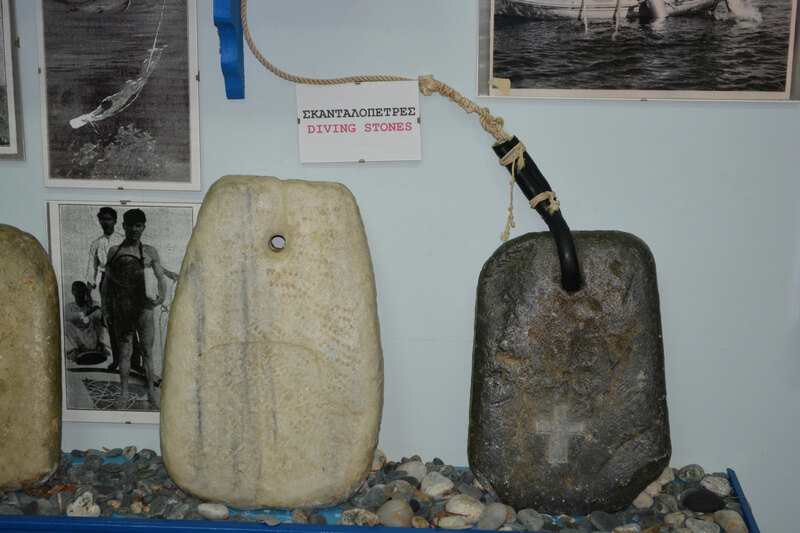 For centuries, Kalymnos remained the center of sponge diving industry in Greece, even though sponge diving was also an important source of revenue for several other Greek islands of the Mediterranean. Note that the waters of the southeastern Mediterranean provide the best conditions for the growth of fine-quality sponge. Hence, the Greek islands, with the high temperature of their sea waters, became the springboard for a thriving sponge industry. 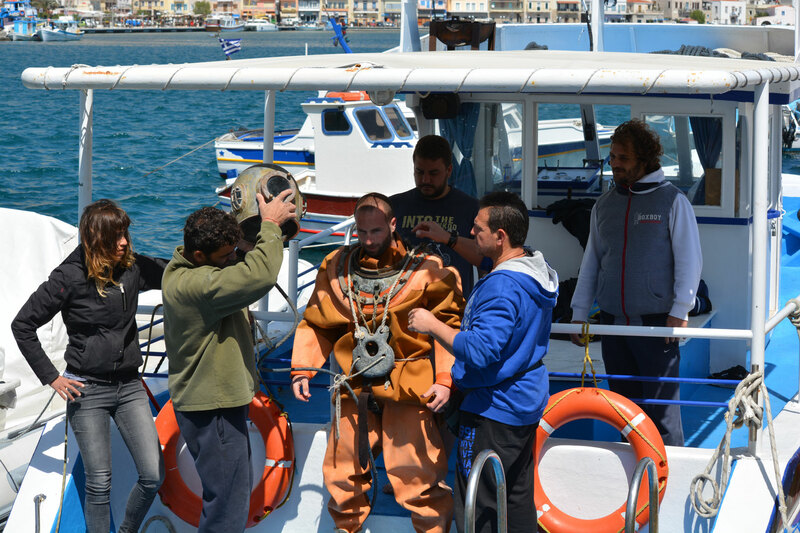 The first divers of Kalymnos gathered their sponges from the bottom of the sea using the skin diving technique. In other words, they dived into the sea naked, carrying a skandalopetra (flat stone weighing about 15 kilograms) in order to sink to the sea floor quickly. The mates of the divers in the boat above would already have ensured the presence of sponges on the sea floor with the help of a glass-bottomed cylindrical tool. The skilled divers would dive up to 30 meters down and stay there three to five minutes gathering the sponges with a special net. Although it was a hard, dangerous and manual technique, the skin diving method produced an abundance of sponges and brought enormous wealth to the island of Kalymnos. 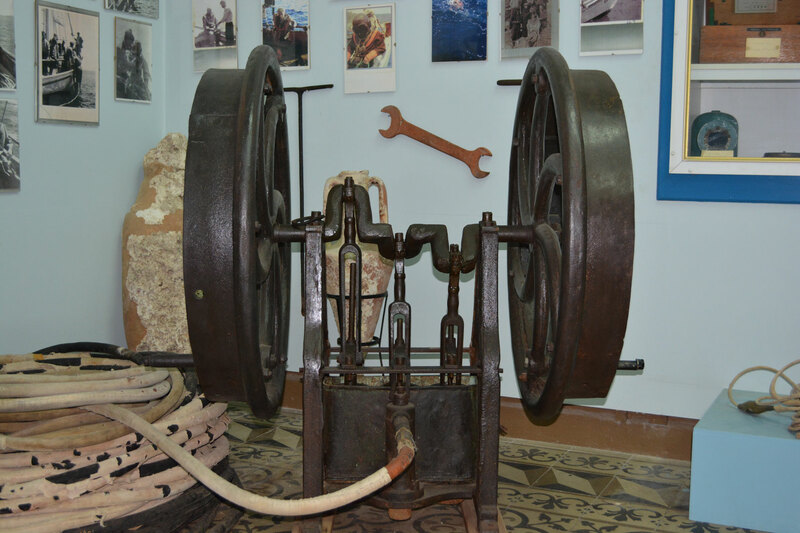 During the middle of the 19th century, the merchants of the island made immense profits from the trade and export of sponges and became highly influential members of society in Kalymnos. The already booming business in sponges got a further boost after 1865 with the introduction of the standard diving suit, the "skafandro", as the Greeks called it. 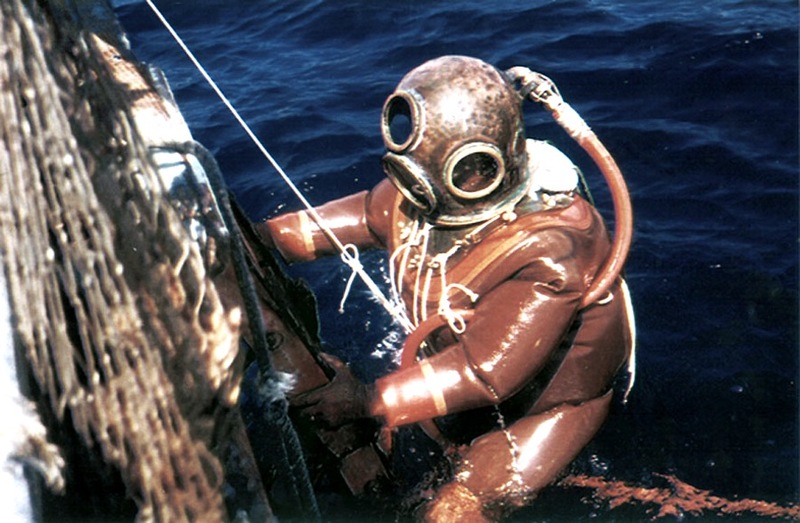 The skafandro enabled the previously naked divers to gather larger quantities of sponges at greater depths (up to 70 meters), staying down for longer periods than was previously possible. 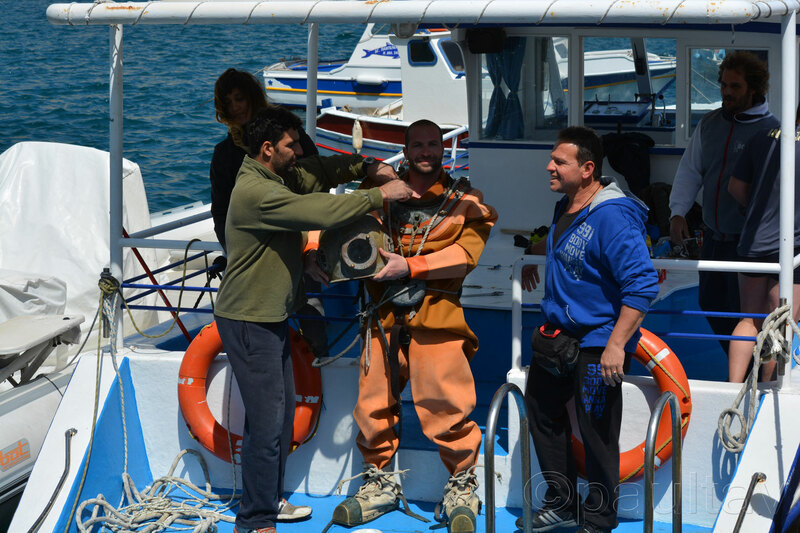 The introduction of the Skafandro brought profound changes to the sponge diving industry in Greece generally and more specifically on Kalymnos. Gone were the days of the small boats in which the naked divers of Kalymnos ventured out to the sea. Now it was the turn of large fleets consisting of numerous ships to mine for sponges on a large scale. 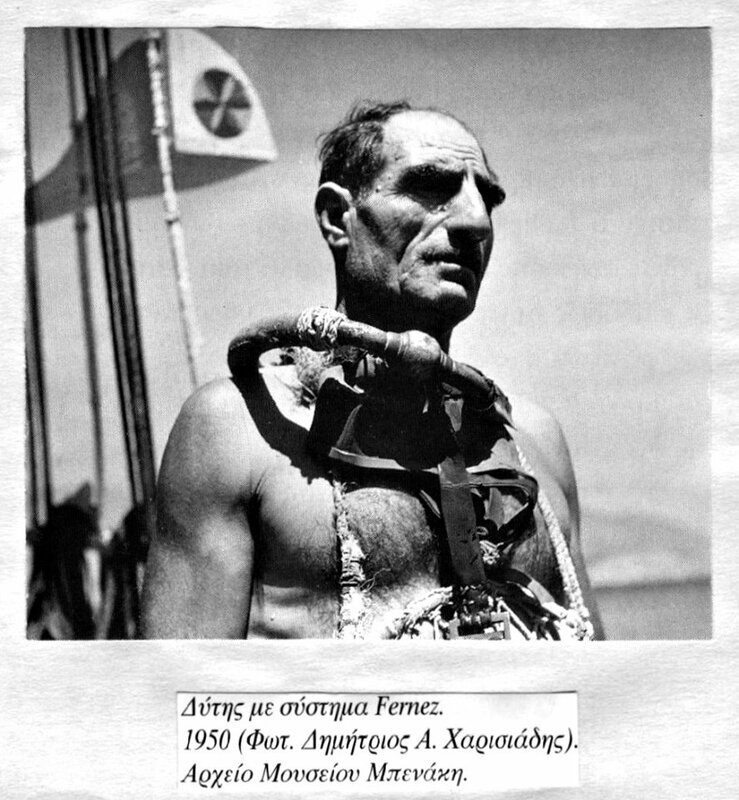 According to Faith Warn, a British journalist and former resident of Kalymnos, the vast sponge diving fleet included 300 ships with 6 to 15 divers for each ship, another 70 ships that used harpoons to harvest sponges and 70 trawlers. 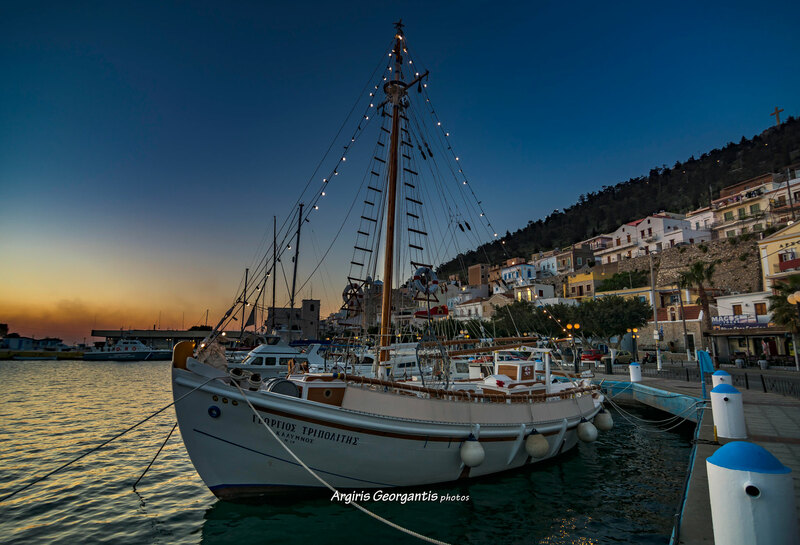 The ships were launched from the island of Kalymnos to scour the Aegean and the Mediterranean, often staying at sea for as long as six months and visiting places as far away as Syria, Lebanon, Egypt, Libya and Tunisia. 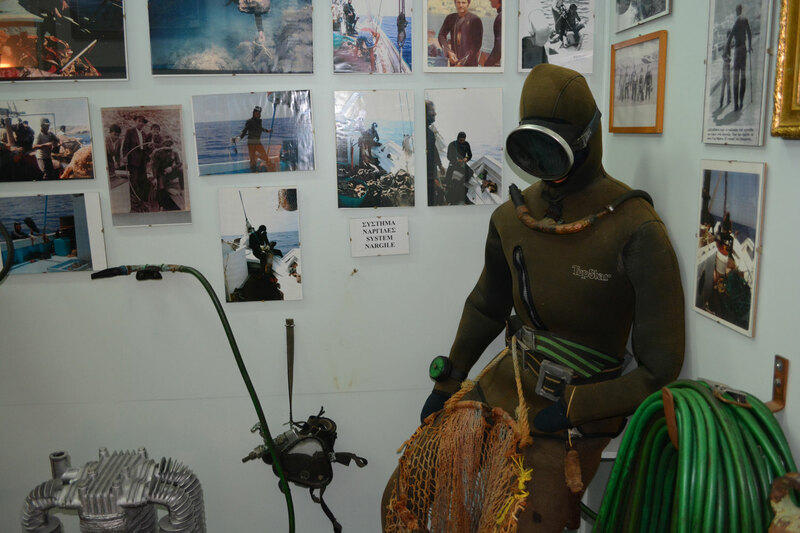 However, the use of the standard diving suit brought in its wake serious risk and danger to the divers who had to make several dives a day at greater depths without any decompression pauses. Such grueling conditions caused great damage to the health of the divers, many of them getting paralyzed and some of them even dying of decompression sickness. According to Warn, the new diving method caused the death of around 10,000 divers between 1886 and 1910; another 20,000 divers were permanently disabled that same period. The dangers of the new sponge diving method had a deep impact upon the families and society of Kalymnos. Every household on the island could count at least one family member who had either died or been paralyzed during the sponge diving season. The situation became so dire at the end of the 19th century that the Turkish sultan, who then ruled all Dodecanese islands, banned the use of the Skafandro at the request of the suffering women of Kalymnos. However, the ban was short-lived as the profits of the sponge diving industry plunged causing serious economic concern. The Skafandro returned after a few years, bringing in further deaths and disabilities due to decompression-related accidents. The benefits though also grew up. Commerce flourished and merchants made immense fortunes. The common people also benefited as free healthcare and education was made available to everyone. The two World Wars of the 20th century seriously disrupted the sponge diving industry of the island which came to an almost total end after the Second World War. 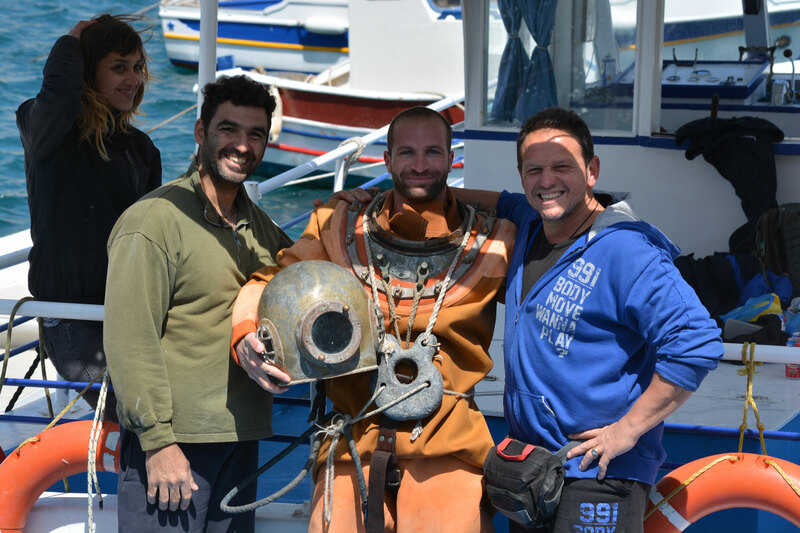 Many of the skilled sponge divers resettled in various parts of the world, such as five hundred divers from the Dodecanese who found a new home in the USA. Many divers also found opportunities in Australia's pearl industry after the Australians refused to work with Japanese pearl divers due to the bitterness caused by the Second World War. The 1980s tolled the death knell for the Greek sponge diving industry when most of the sponges in the eastern Mediterranean and the Aegean Sea were found to be infected by pollution. The sponge diving fleet was reduced to four, from a previous high of about 30. Now all that remains on Kalymnos of the once-thriving sponge industry is several workshops in Pothia, selling sponges to tourists as well as a nautical museum exhibiting articles relating to the once flourishing sponge diving.